This article is no longer up to date and needs to be updated with new information from Halo: Fleet Battles. You can help by updating this article. This article is about the starship weapon. For other uses, see Plasma cannon. Gaff Naran-pattern - Used on the Hekar Taa-pattern Blockade Runner. Sono-pattern - Ket-pattern CCS-class battlecruisers. Melusean-pattern - Used on the Sinaris-pattern CPV-class heavy destroyer, the Varric-pattern ORS-class heavy cruiser, the Mjern-pattern DSC-class support ship, and the SDV-class heavy corvette. Plasma bolts impacting the UNSC Pillar of Autumn in Halo: Combat Evolved. Three of Ardent Prayer's plasma cannons, one of which is firing. 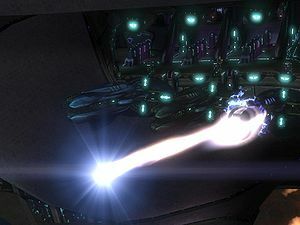 An SDV-class heavy corvette's plasma bolt impacting an evacuating civilian transport during the Fall of Reach in Halo: Reach. Render of the Ardent Prayer's plasma cannon. Cropped render of the previous image. The controls of the Ardent Prayer's plasma cannons. A view of the plasma cannons on the Ardent Prayer. Two of a corvette's plasma cannons firing. The plasma fire from a Blockade Runner in Halo 5: Guardians. ↑ For an elaboration on the plasma cannons' relation to plasma torpedoes and the ambiguities in distinguishing between the two weapon systems, see Plasma torpedo#Terminology.